Ann Demeulemeester, fall 2000 collection. Lafayette Vibre concept, 2000; introduced bold color into her spring collections, 2000. Exhibitions: La bienale de venise avec Rodney Graham, Anvers, 1993. Awards: Golden Spindle award, Belgium, 1983; Golden T award, Spain, 1992. Address: B.V.B.A. "32," Populeerenlaan 34, B-2020 Antwerp, Belgium. Mower, Sarah, "Six Romp," in The Guardian (London), 12 February 1987. Grauman, Brigid, "The Belgium Connection," in Elle (London), October 1987. "Ann Demeulemeester en grande," in Le Nouvel Observateur, 15November 1991. Sepulchre, Cécile, "Ann Demeulemeester," in Journal du Textile, 12October 1992. Dombrowicz, Laurent, and Pascale Renaux, "Ann Demeulemeester, belle et rebelle," in Jardin des Modes, November 1992. Spindler, Amy M., "Three Designers Thrive on Fashion's Unraveled Edge," in New York Times, 15 March 1993. Mair, Avril, "This is the New Vision," in i-D (London), 11 May 1993. Spindler, Amy M., "Coming Apart," in New York Times, 25 July 1993. "Trois créateurs: Ann Demeulemeester," in Arte Magazine, 27 November-3 December 1993. "La Cote des Createurs: Les 'baroques' sont plébiscites par les boutiques," in Journal du Textile, 28 February 1994. "The Paris Collections: The Ideas of March: Ann Demeulemeester," in Women's Wear Daily, 17 March 1995. Spindler, Amy M., "A Mature Mugler, Demeulemeester and Lang," in the New York Times, 18 March 1995. "Tales of Paris," in Women's Wear Daily, 16 October 1998. Raper, Sarah, "Ann of Antwerp," in Women's Wear Daily, 4 October 1999. "Tales of Paris," Women's Wear Daily, 3 March 2000. Linked to a group of designers to come out of Belgium in the mid-1980s, Ann Demeulemeester's deconstructed style has come into its own as the 1990s have progressed. Her work, with its monochromatic color schemes and matt layering onto the body of flowing columns of fabric, encapsulates the contemporary Zeitgeist. The impact of this Belgian avant garde designer's pared-down structure, combining rough edges with more traditionally cut suiting, has been comparable to that of Japanese designers Kawakubo and Yamamoto a decade earlier. Both superseded more overtly designed fashions in favor of purer silhouettes combining references to antique clothing with the worn-in patina of their fabrics and a disregard for the more conventional notions of fit. Demeulemeester's work represents (along with Margiela, Dries Van Noten, et al) a recognizable 1990s approach to clothing and designer style. It overtakes the often directionless attempts to integrate the sportswear styles of the late 1980s into a high-fashion context and the myriad of 1970s reworkings in the early 1990s. Dedicated to this more experimental strain of fashion, Demeulemeester, having won early accolades for her designs while still at college, pays great attention to detail. From the start she used local craftsmen to create her work. In the late 1980s her designs were more attuned to fashionable classic garments. In 1987 short, black, sunray-pleated skirts were shown with crossover braces and crisp white shirts, worn with stark gabardine coats. Even at this stage, however, she showed concern for proportion, constructing skirts and dresses with adjustable waistlines that could be worn high or low, altering the emphasis of the design to suit the figure of the wearer and give a different sense of balance to the overall outfit. The appeal of designs which are at the cutting edge of fashion and yet ultimately still wearable has ensured Demeulemeester's success, and, as her work has grown in confidence, so have her sales. The strong lines of her signature long coats and dresses are punctuated by more deconstructed styles like the frayed-edged lacy knit top shoe showed in 1993. This, with its shrunken fit, married the resurgent punk ethos of rough, makeshift antifashion to the languorous swing of gothic-inspired floor-skimming coats. Her autumn-winter collection for 1993 continued in this vein. Shroud-like white dresses with overlong cuffs and black velvet and brocade coats were set against fitted crêpe sheaths, their differing textures giving a sense of shade and light to provide interest and definition to each outfit. The trumpet cuffs and jet crucifixes with which these were teamed gave a religious aspect to the show which was echoed amongst her contemporaries. Although there will inevitably be a backlash against such austerity, Demeulemeester's work is strong enough to outlive short-term trends and consolidate her name as a designer of avant-garde independent styles, incorporating an artistic use of fabric and texture and an attention to detail. Demeulemeester's first dedicated store opened in her hometown of Antwerp in 1999 and features both her men's and women's collections. She wanted her first store to be close to home so she could be there as much as possible, rather than opening in a more high-profile location such as New York. The store, housed in a historic building, has an interior design that reflects the fabrics and draping typical of her clothing. The designer's fashion-forward reputation has placed her in many retail locations specializing in cutting-edge designers. She was one of the initial labels, for example, in the Vibre concept shop launched in 2000 by Paris-based Galeries Lafayette. Demeulemeester maintains total control over her business. Unlike many other labels, she does not license but rather oversees most production and all creation and distribution in-house. Her operation is self-financed and has grown slowly according to plan. She has been successful internationally, as well, especially in Asia, where Japan, Singapore, South Korea, and Hong Kong together represent one-fifth of total turnover. Demeulemeester's clothes are often termed minimalist, yet they sometimes feature a certain amount of complexity. In the late 1990s, her twist tank tops and handkerchief-wrap dresses—which typify her love of twisting and asymmetrical silhouettes—came with instructions. She loves a variety of unusual fabrics, such as painter's canvas, parachute nylon, polished leather, washed denim and distressed suede. Her interest in unusual fabrics adds a surprising amount of diversity to all-white or all-black ensembles. She takes simple items such as a t-shirt or slacks and gives them an almost sculptural feel, often through the use of innovative surface treatments. Her accessories designs are also critically acclaimed. Some critics have commented that Demeulemeester seemed out of sync with trends at the turn of the century, creating similar spiraling, draping, asymmetrically hanging, and often monochromatic clothing year after year. This was one concern with her spring 2000 collection, at which Women's Wear Daily pointed out that one of the few surprises was her bold and bright use of color. 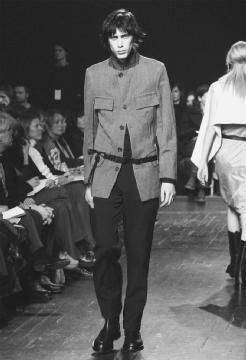 Yet Demeulemeester remains true to her own vision, creating smart clothing independent of fashion trends. And her loyal cadre of customers, including rocker Patti Smith (who has influenced many of her designs), appreciate her simple, wearable, and relaxed apparel, which, despite its practicality, has an aura of cool.